This incredible installation was created by Courtney Mattison and is on display at Skidmore College in Saratoga Springs NY. 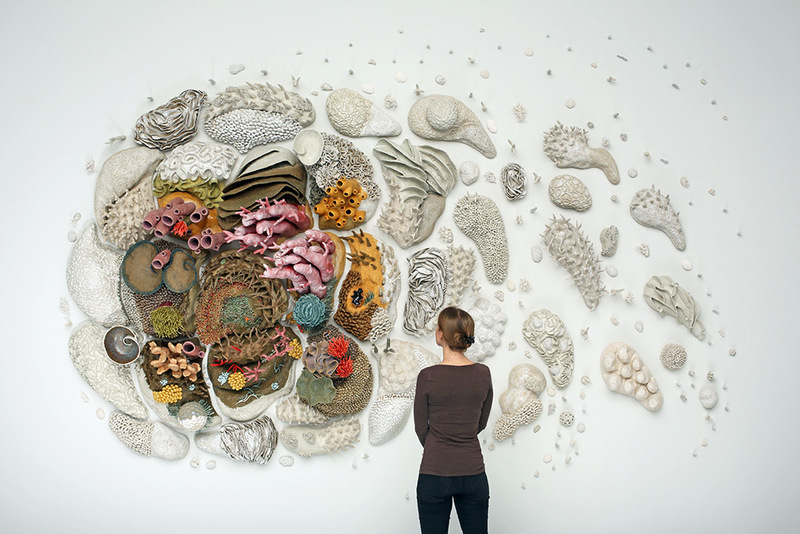 Created out of glazed stoneware and porcelain, the level of detail is astounding, Courtney clearly knows coral biology. The description of the exhibit points out that the colorful live coral is surrounded by an area of dead bleached skeletons, showing the parallels to state of the world’s reefs. Courtney has several other exhibits around the country if you can’t make it upstate, but seeing as horse racing and outdoor music (Tanglewood) season is about to start, this is yet another reason to visit the beautiful Berkshire region. You can also get your own pieces from Courtney’s Etsy shop Corallia.